Maybe you have been told time and time again that if you pay your dues and keep plugging away, you’ll gain enough experience through “the school of hardknocks” to be successful. That might be true. But maybe you want to reach your goals faster. Maybe you want to earn more, beat the odds—and do it with class and style. If so, it’s time to get scrappy. Scrappy people see big problems and come up with big solutions. Or they see ordinary challenges and find a new path to extraordinary results. They’re like the entrepreneur who turned his home into an indoor jungle—complete with waterfalls, tropical birds, and a live baboon—to sell investors on the now famous Rainforest Café restaurant chain. Or the Girl Scout who skipped the usual door-to-door cookie sales and set up a table outside a medical marijuana dispensary, selling 117 boxes in just 2 hours. It can seem like these successes are just one-off acts of ingenuity or isolated flashes of brilliance...but are they? In today’s world you need more than just an occasional burst of creativity. You need a consistent attitude, a proven strategy, and a tactical plan for execution. That’s where Terri Sjodin’s Scrappy can help you, by explaining and demonstrating the unique elements behind any successful scrappy effort. 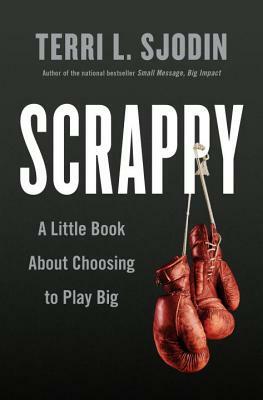 • Why getting scrappy is a choice to play big. • How to cultivate your best ideas. • How to manage risks and bounce back from mistakes and failures. • How to scale a scrappy culture within anyorganization, big or small. As Sjodin puts it, "This is not another book about persistence, although scrappy and persistent make a winning combination. Nothing annoys a persistent person more than a scrappy person who pulls off a classy, unexpected, amazing effort to land the deal, the sale, or the opportunity." Whether you're a sales rep, a job seeker, an entrepreneur with big dreams but a small budget, or a corporate executive aiming for the next level of success, the fastest way to get what you want is to get scrappy. Terri L. Sjodin is the author of Small Message, Big Impact and the principal and founder of Sjodin Communications, a public speaking, sales training, and consulting firm. For more than twenty years she has served as a speaker and consultant for Fortune 500 compa­nies, industry associations, academic conferences, CEOs, and members of Congress. She lives in Newport Beach, California.